With natural oak wood as its starting point, furniture designer Alex Gufler crafts a masterwork in this simple, stackable wood dining chair. What starts as a forward thinking design then gets constructed with the best of old world European craftsmanship courtesy of European furniture legend TON. This all comes together to give you a striking, comfortable, well made oak dining chair. The Merano natural oak dining chair offers Italian design and European made furniture quality to make every mea feel special and every celebration stylish. Whether in an upscale kitchen or refined, modern dining room, these designer oak dining chairs deliver on their promise of style and quality. 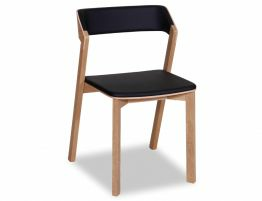 With a combination of natural oak and a comfort driven black seat pad, this highly refined, organic inspired, chic dining chair can elevate a takeaway meal or pizza and wine with friends. Your dining area is one of the most used spaces in your home, don’t limit yourself to throw away furniture. Attractive and built to last, this modern oak, stackable dining chair offer affordable refinement ideal for your modern living spaces.